A view with the lid removed. A close-up of the molded finial. 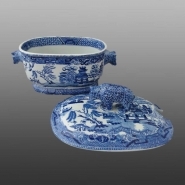 A rare pearlware sauce tureen with lid printed in blue in the Standard Willow pattern. Rarity is attributed to the unique and beautifully molded finial and handles in the shape of a bear. No other examples are known.